Director: Armando Iannucci. 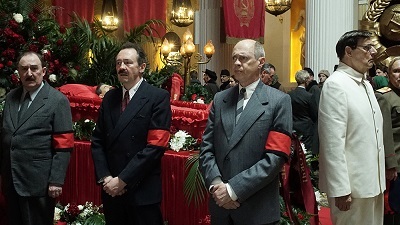 Cast: Simon Russell Beale, Steve Buscemi, Michael Palin, Jeffrey Tambor, Jason Isaacs, Andrea Riseborough, Rupert Friend, Adrian McLoughlin, Paddy Considine, Tom Brooke, Olga Kurylenko, Paul Chahidi, Karl Johnson, Paul Whitehouse, David Crow, Dermot Crowley, Sylvestra Le Touzel, Alexandr Piskunov, Cara Horgan, Jonathan Aris, Tsai Sheng-Chien, Dave Wong, Gerald Lepkowski. Screenplay: Armando Iannucci, David Schneider, Ian Martin, and Peter Fellows (based on the graphic novel by Fabien Nury and Thierry Robin). Twitter Capsule: Ambitious in both content and tone; more precise with the former than the latter. Gamely but unevenly acted. VOR: ③ Aims for more than mordant, sarcastic levity and takes more risks than In the Loop, even if it also hits fewer of its marks. Visually flat.